We went to Sweden for Midsummer this year. Let’s see… completely deserted cities – check. 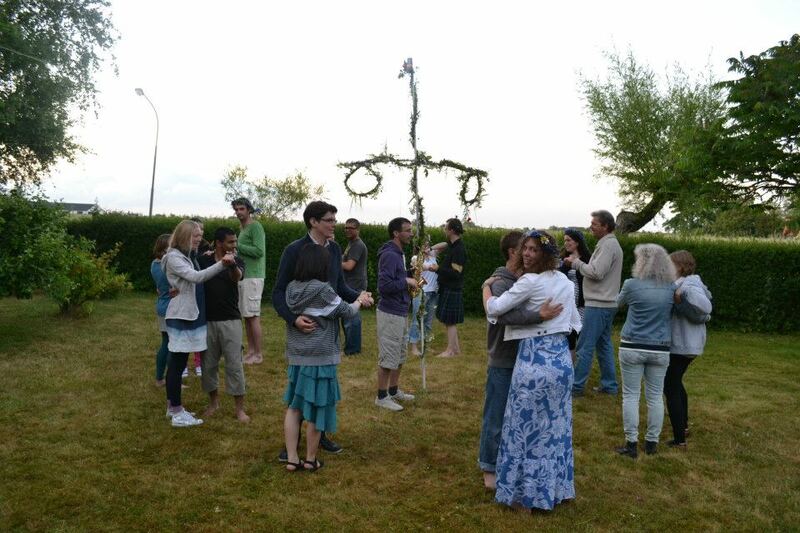 Maypole dancing – check. Consumption of very strong local alcohol – check. Outdoor swimming – check. Sauna – missed that one. Find love – no need ;). The trip was off to a good start (well, apart from having to get up at 4am) when I realised that, unexpectedly, I actually like Ryanair. Their seats don’t recline!! I would actually pay extra for this, seriously. I can never sleep on planes anyway so the reclining isn’t any good to me, and I always seem to end up behind someone who pushes their seat right back in my face straight away, so it was really nice to find that for once they couldn’t. (On the negative side, my hand luggage was so close to the weight limit that Game of Thrones would have pushed it over if I hadn’t been able to jam it into my pocket instead. I’m starting to see the attraction of a Kindle, though can’t really justify buying any more gadgets right now. Besides, Game of Thrones is so dense that one gets the feeling loading it onto a Kindle might make the Kindle gain a kilo or two). I may have been surprised to find I liked Ryanair, but I wasn’t surprised that I liked Sweden. Everything seemed clean, efficient, safe and friendly. I like that they’re more socialist than Britain and have actually made it work. (When we have the Scottish independence referendum, can we have an option to split off from the UK and join Scandinavia instead? Pleeeease? 🙂 ). Anyway… the YouTube video above really wasn’t kidding about the cities being deserted. Wandering through the completely empty streets of Malmo was quite eerie, like exploring a ghost town. My friend’s house when we got there, on the other hand… not so deserted! Inside the front door we were greeted by a sea of discarded shoes in the front hall. Even allowing for the fact that there were probably at least two shoes per person, there were still a LOT of people in there. Lots of people is good, though, for midsummer celebrations. 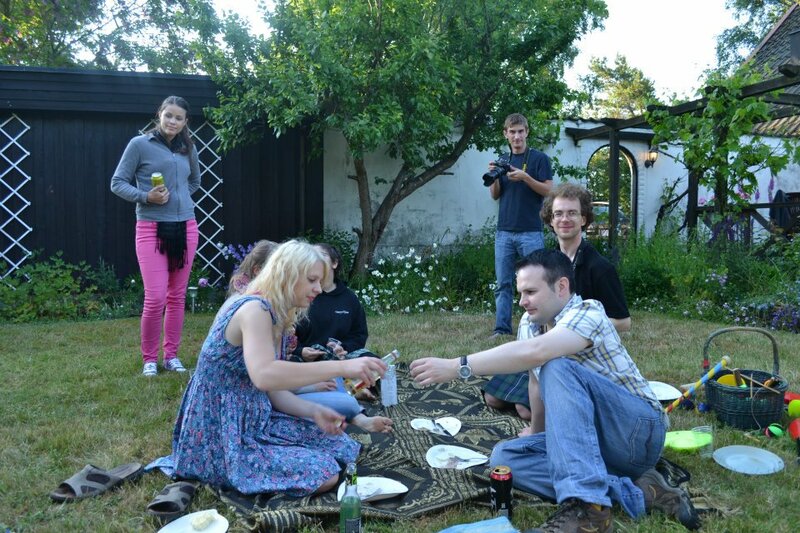 Once the rain cleared up slightly, we had food followed by drink. We hadn’t managed to buy any drink on account of all the shops being shut for Midsummer by the time we arrived, but that didn’t matter… the traditional strong Swedish spirits were flowing (as well as some strong German spirits) and shots of them could be earned by joining in with the folk singing. I don’t think I’ve ever had so many shots in one sitting before… I’m amazed I managed to stand up and even manage the subsequent Maypole dancing without crashing into anything important. After a night on the floor, we awoke to even better weather, so it was beach time. For the first time since school I played a rounders-type game (brannbol I think it was called) and actually enjoyed it this time. Though I still wasn’t any good at it – when I did finally manage to catch the ball, I was so stunned that I threw it on about twice as hard as I meant to and it went sailing right over Laura’s head. Oh well. 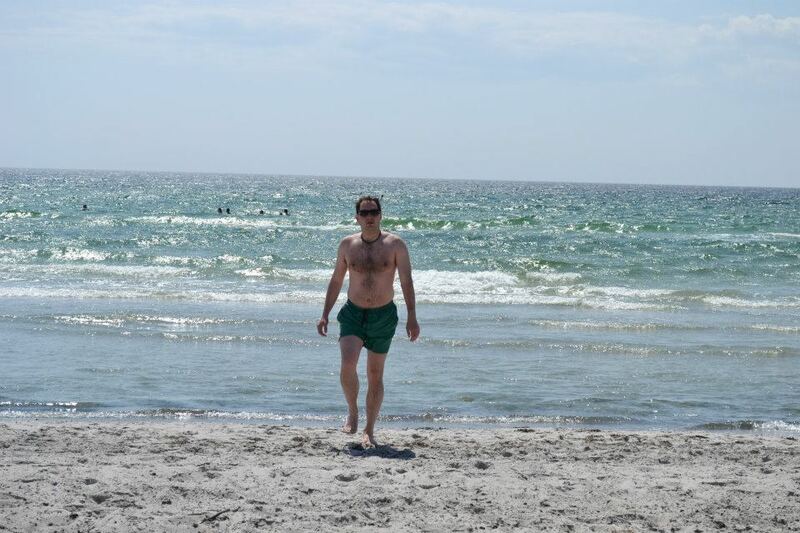 Then it was time for a dip in the sea. The water was cold at first but not as cold as in Scotland, and by the time I’d waded out far enough for it to reach my waist, I was quite used to it. Afterwards I didn’t even need to dry myself, just lie there a while and let the sun do it for me. Unfortunately I managed to fall down a hole by a child’s sandcastle and injured my ankle. I hope they were proud of their very effective defences. The stick throwing game was making it worse so I had to give up on that, but thankfully I was better later on for barbecue, card games, four player Snake, and piano playing. (I’d forgotten how nice it is to play a real piano rather than a keyboard). Our last day was spent looking round a slightly less ghost-town-like, but still just as wet, Malmo and then chilling out again back at the house. Enough people had left that we managed to claim an actual not-quite-double-but-bigger-than-single bed, but I actually slept worse than I had on the floor, having been too hot and worried about falling off the edge. It was an awesome little holiday :). Afterwards I had all of one day back home before I was off to Berlin… which is where I am now, but that’s for another post (probably).